After my success with Camilla’s lemony lentil and quinoa salad recipe last week, I was excited to try my hand at another quinoa salad recipe. What can I say, except I’m a creature of habit, who likes to repeat what’s working for me. 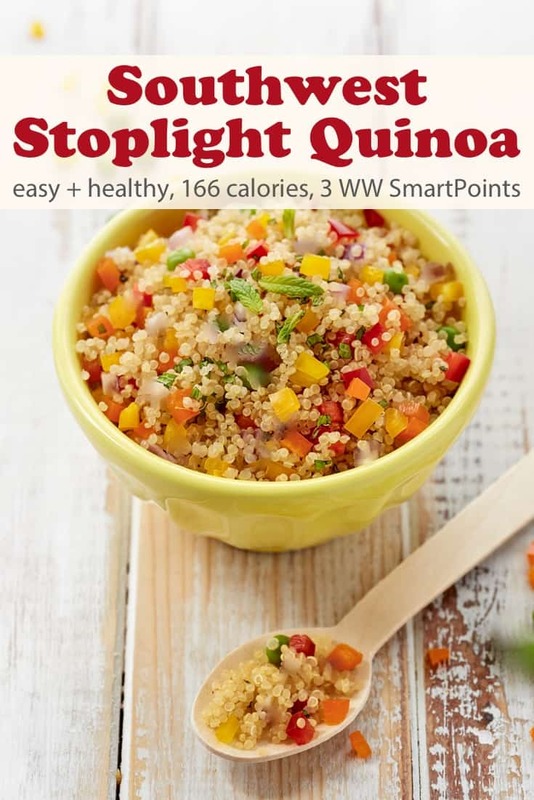 This one is a quinoa variation for Stoplight Salad featured in the Simply in Season (affiliate link), a fun cookbook full of recipes that celebrate fresh, local foods in the spirit of the World Community Cookbook, More-With-Less Cookbook (affiliate link). 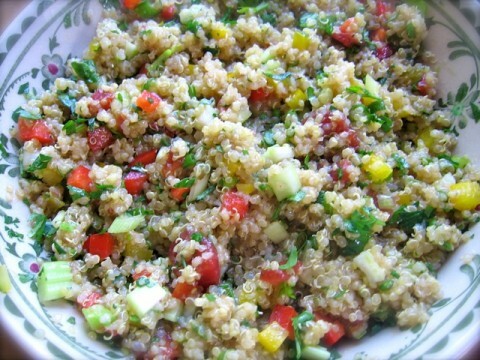 How Many Weight Watchers Points in this Southwest Stoplight Quinoa Salad Recipe? Each serving has *3 WW SmartPoints if made without corn and *4 SmartPoints with corn. Following the updated WW Freestyle/Flex Plan, this is *3 WW Freestyle SmartPoints for a generous 1/2 cup serving. Once again, I’m pleasantly surprised with the results. This colorful tasty southwest quinoa salad is great on its own as a light lunch or served alongside grilled meat, chicken or fish for an easy healthy dinner. It’s a great gluten-free Weight Watchers friendly alternative to rice, with only *4 Weight Watchers PointsPlus, *3 Freestyle SmartPoints per 1/2-cup serving. Curious about WW Freestyle/Flex Program? 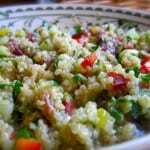 If you’ve made this southwest quinoa, please give the recipe a star rating below and leave a comment letting me know how you liked it. A fun tasty salad named for its bright red, green and yellow colors. 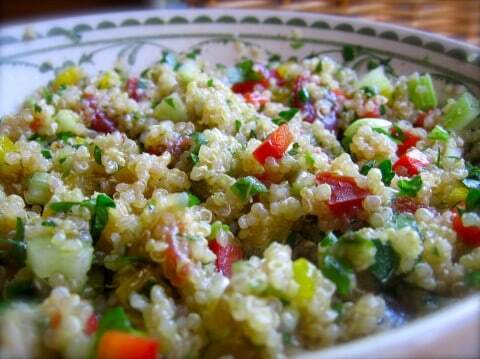 In a large bowl, stir together the quinoa, corn (if using), diced peppers, green onions, and cilantro until combined. In a small bowl whisk together the olive oil, lime juice, garlic, oregano, cumin, chili powder and cayenne pepper, until well blended. Pour dressing over the salad. Toss gently. Your salad looks great, and thanks for the mention! Can’t wait to try this recipes! It looks so healthy, full of veggies and low in points!